Practitioners must follow court rules for their pleadings and briefs, but courts can do what they want. Here are my suggestions for formatting court orders and opinions. For more and better guidance, see Matthew Butterick, Typography for Lawyers (2d ed. 2015) or his website. Don’t use Courier. I recommend a serifed typeface for the body text (my example uses Cambria), and I follow the recommendations of many layout experts to avoid Times New Roman. I believe it’s appropriate to format short, topic headings in a contrasting sans serif font (my example uses Calibri Bold). Although double line spacing is ubiquitous in legal documents, it’s problematic for on-screen skimming and readability and because it uses lots of paper if printed. Some say double-spacing makes documents readable. Yet no one reads double-spaced books, magazines, or newspapers, let alone web pages. Instead, apply reasonable line spacing (my example uses 1.2) and push in the left-right margins to reduce the line length (my example uses 1.5 inches). Use only one tab to indent paragraphs, and consider shortening the tab (my example uses .25 inches). If you want full justification, you should turn on hyphenation to reduce gaps and spaces (my example does). If you dislike hyphens, check out most newspapers and magazines and nearly all books: they’re hyphenated. If you still dislike hyphens, left justified text with a ragged right margin is fine for legal documents, I say. Use italics instead of underlining. Avoid ALL-CAPS. Add text to the outline numbers. You can use topical headings: Introduction. 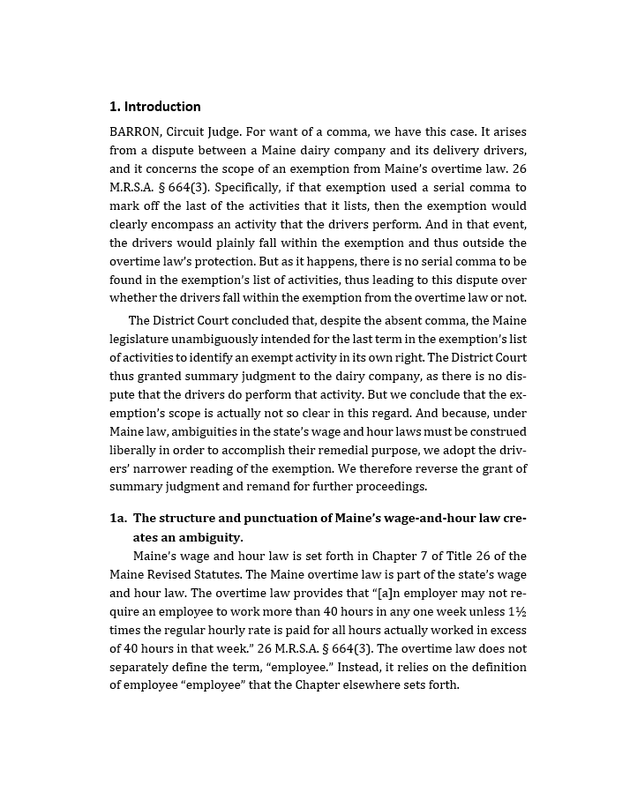 You can also use explanatory headings (point headings): The structure and punctuation of Maine’s wage-and-hour law creates an ambiguity. This entry was posted in Design on April 10, 2017 by Wayne. You’ve probably heard about that “serial comma case,” O’Connor v. Oakhurst Dairy. The decision, Judge Barron of the First Circuit tells us, was based on the absence of a serial comma, which is the second comma here: red, white, and blue. For punctuation nerds, it’s an interesting case, and I hope to write more about it. For now, I encourage you to read the opinion in its original format. Why? Because it’s outdated, dysfunctional, and annoying. At least that’s what I think. Here are my reasons. Readers can probably infer from my critique what the preferred formatting practices would be, but I’ll go over them next week. This entry was posted in Design on April 4, 2017 by Wayne. According to reliable style manuals (I’ve cited four at the bottom of this post), writers should use the en dash, not the hyphen, for number spans. I don’t know if you can see the difference, but the en dash, the correct mark, is longer than the hyphen. Although I agree with the rule, I’ve recently learned something that could affect your choice of horizontal mark. You get a 50% savings with the hyphen. In a lengthy brief subject to a word count, you could save some words by using the hyphen. You save two words every time you use the symbol instead of periods and spaces. 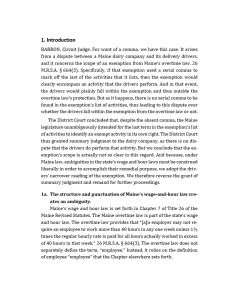 Bryan A. Garner, The Redbook: A Manual on Legal Style § 8.13 (3d ed. 2013). This entry was posted in Design on October 27, 2015 by Wayne. Nearly every legal document can benefit from clear, consistent headings. The guidelines here are particularly useful for memos, motions, and briefs. In part 1, I describe two kinds of headings, give typeface advice, and offer suggestions for placement and alignment. I’ll discuss two kinds of headings: topic headings and explanatory headings. I use the name topic heading for single-word or short-phrase headings that identify topics, like Argument, Discussion, and Statement of Facts. Because a topic heading isn’t a complete sentence, it doesn’t take a period, and you typically capitalize each main word (Initial Caps). I use the mnemonic C-A-P to remember to capitalize everything but conjunctions, articles, and prepositions. The heading above this paragraph is a topic heading. Topic headings should stand out from the body text, and here are three good options. (1) Use boldface. Yes, ALL-CAPITALS and underlining are common for topic headings, but if you follow modern typographic principles, you’ll avoid them: they can impede reading and are vestiges of the typewriter. (2) Make topic headings slightly larger than the body text by 1 or 2 points, then add boldface. (3) Use a contrasting font (my preference). A contrasting font? Yes. If the body text is in a serifed font like Cambria, Garamond, or Century Schoolbook—and it probably should be—then topic headings in a sans-serif font like Calibri, Tahoma, or Verdana will really stand out. Topic headings designate the major sections of a legal document. For example, in a motion for summary judgment, the topic headings might be Introduction, Statement of Facts, Motion Standard, Argument, and Relief Sought. Because of their nature and the way they’re displayed, they don’t require numbering. Topic headings are often centered, but that’s not a rule; it’s merely a common convention. Knowing, as we do, that many readers will read memos, motions, and briefs on a screen, and knowing that screen readers have a top-left viewing preference and skim a lot, it makes sense to put topic headings on the left margin. That’s what I do. Legal documents often use explanatory (point) headings. I use the name explanatory heading (and point heading) for the full-sentence headings and sub-headings that break up a discussion or argument. The persuasive point headings in motions and briefs are the most common types of explanatory headings, but lawyers use non-persuasive explanatory headings, too. I used one above this paragraph. If a heading is a complete sentence, and an explanatory heading generally should be, then it takes a period. If it’s a sentence, use sentence case, capitalizing only the first word. DON’T SHOUT AT THE READER WITH ALL-CAPITALS, and Avoid Using Initial Caps For Explanatory Headings Because It Looks Odd. The best way to make explanatory headings stand out is to use the same (serifed) font as the body text but to emphasize it with boldface, bold italics, or italics. That gives you three outline levels beneath the topic headings. Generally, place the first-level explanatory heading on the left margin and indent each lower level one more tab length. As you format explanatory headings, keep these tips in mind: (1) Avoid over-indenting. If you indent more than three tab lengths, you spoil the left-alignment screen readers and skimmers prefer. (2) Keep explanatory headings to three outline levels if possible. It simplifies things for the reader and helps prevent over-indenting. (3) Use indentation, not mere tabbing, so subsequent lines of text align with the first. Look at these examples. Yours should look like number 1. This entry was posted in Design, Organization on September 17, 2015 by Wayne.